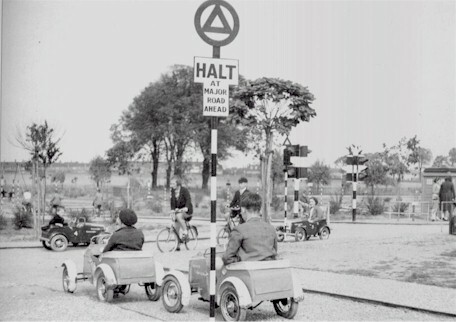 You could hire a model car or bicycle to ride around the mini-road system. 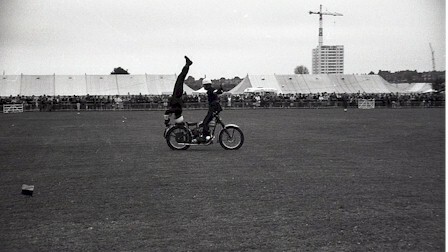 Alternatively, on payment of a small fee, you could use your own cycle. 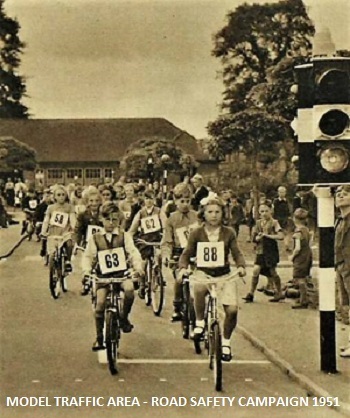 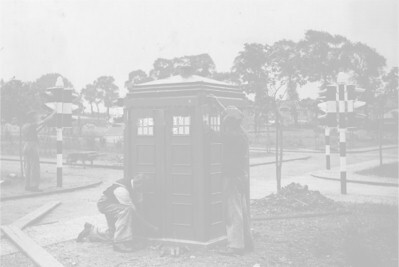 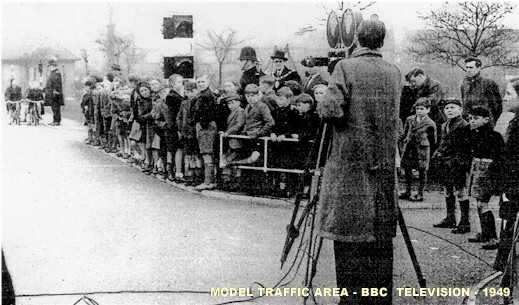 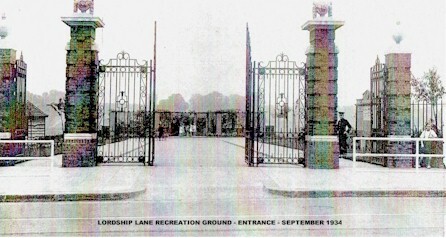 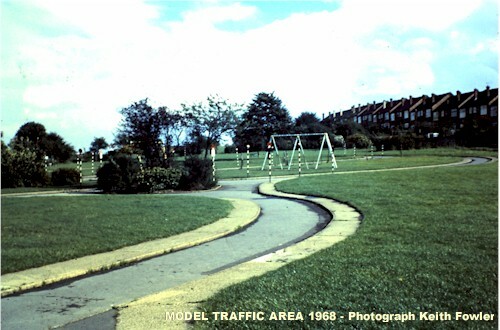 There were also various pieces of play equipment sited within the landscaped areas of the road system, so that children were forced to cross the roads and thus encouraging road safety training There were miniature traffic lights, pedestrian crossings, roundabouts and even a miniature police call box. 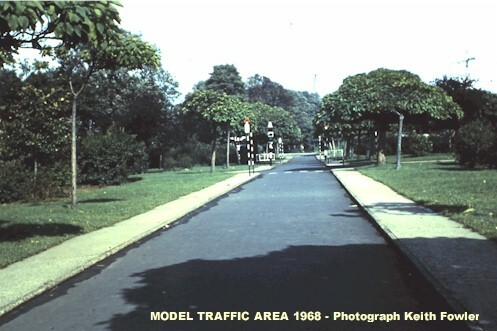 The Model Traffic Area has been described as a unique example of a pioneering education facility and much loved by those who had the privilege to use it as children. 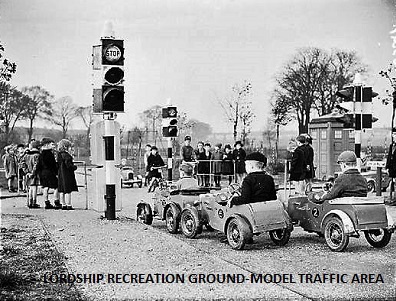 The following photograph is a wonderful panoramic view of the Model Traffic Area dating back to the early 1950's, and we are indebted once again to Bruce Castle Museum for allowing us to reproduce this picture on our website. 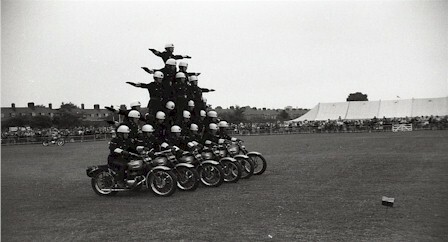 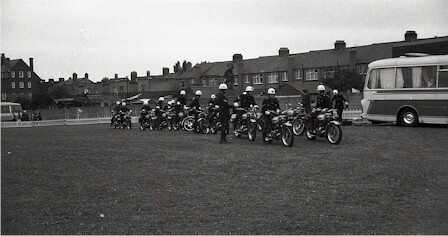 The following two photographs date back to 1968 and were kindly sent to us by one of our regular contacts, Keith Fowler, and we acknowledge his permission for us to use these images on this feature. 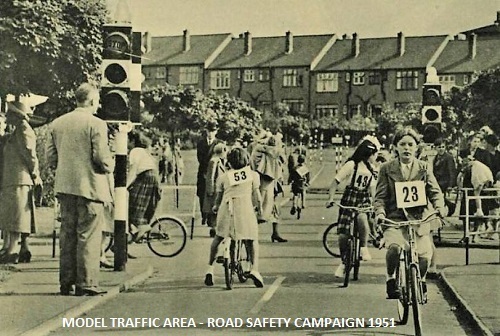 They say you should always remember things as they were or face disappointment and I am afraid this is very true of the Model Traffic Area. 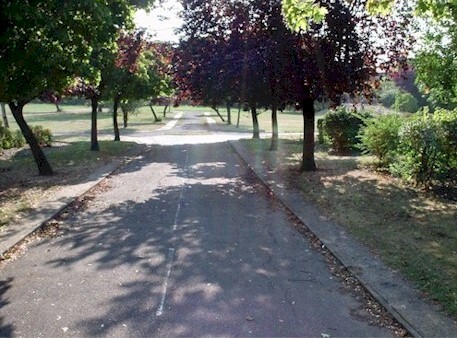 On a nostalgic trip back to Lordship Rec in 2003 I was surprised to discover that, after several decades of under investment and neglect by the local council, the whole area is now in a sad state of disrepair. 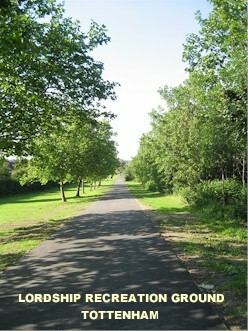 The following photographs that I took during the visit help illustrate this point. 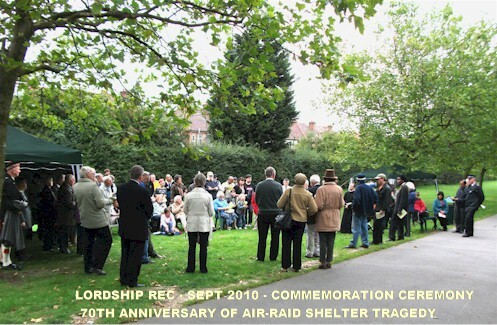 Following the 70th Anniversary Commemoration Ceremony in September 2010, I took the opportunity to look at the Model Traffic Area and the surrounding park again to see what state of repair the area was now in and I was pleased to see that, thanks to the efforts of the 'Friends of Lordship Rec', the area looked in much better condition and there had been no significant further dereliction of the facility. 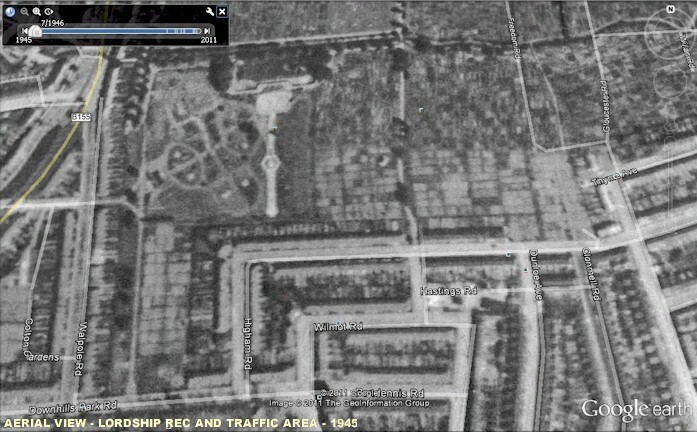 We have recently received from 'The Friends of Lordship Recreation Ground' two wonderful aerial photographs that show the Model Traffic area in both 1945 and 1999. 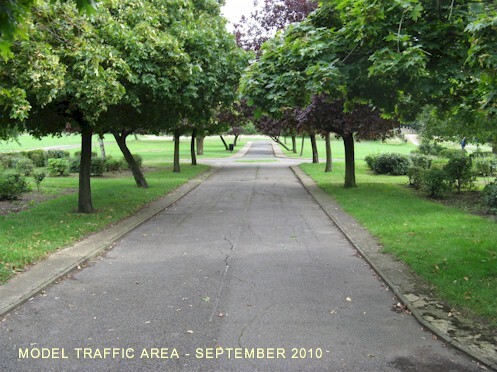 We acknowledge the permission given by them for us to reproduce the photographs below. 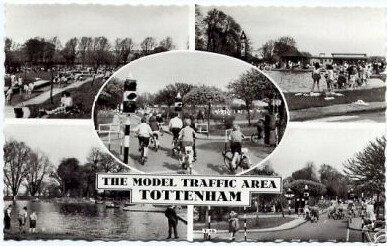 Many people will also remember that, in addition to the Model Traffic Area, there was also the Boating Lake and Paddling Pool Area. 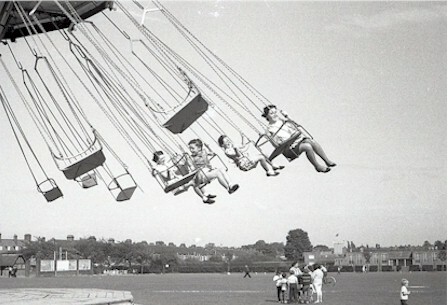 This was very popular in the 1950's and 60's particularly on those hot Summer days which are of course the only ones we remember from our School Holidays. 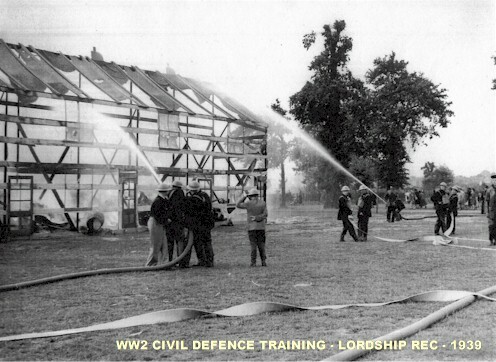 We must have had wet days but somehow we never remember them. 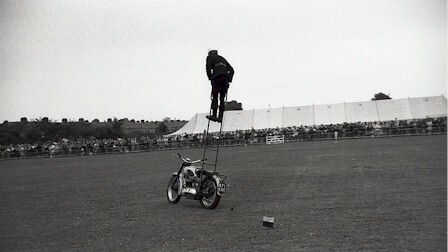 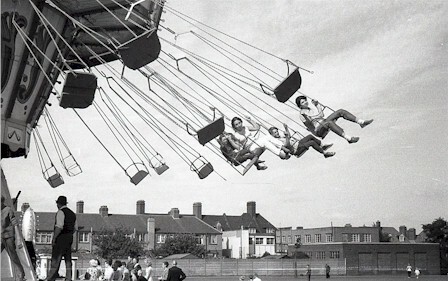 The following photographs should bring back fond memories of those carefree days. 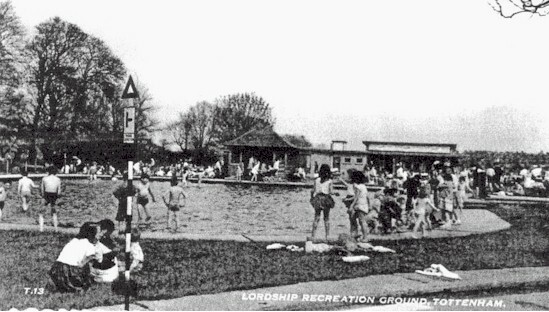 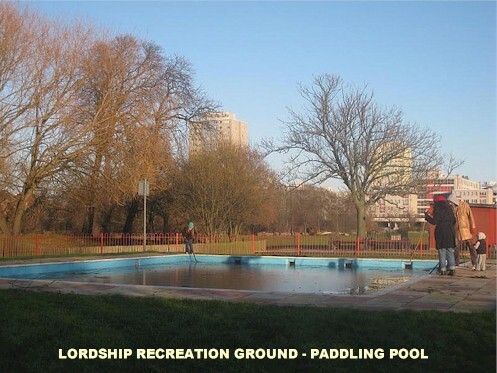 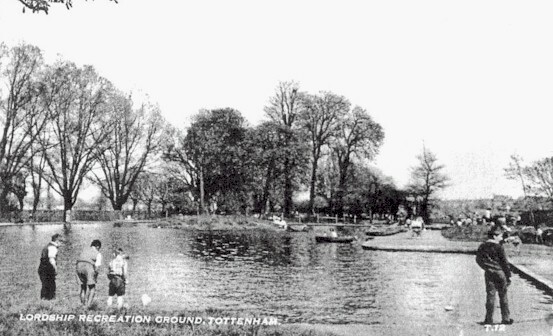 Many will recall that the Paddling Pool was at the bottom of a series of mini-pools that cascaded down the slope from the Higham Road entrance of Lordship Rec. 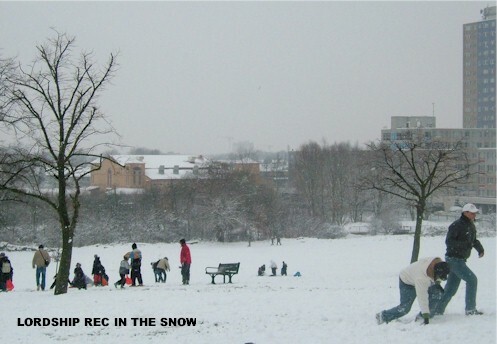 Behind the trees in the background was the Moselle Brook that also run through the Recreation Ground. 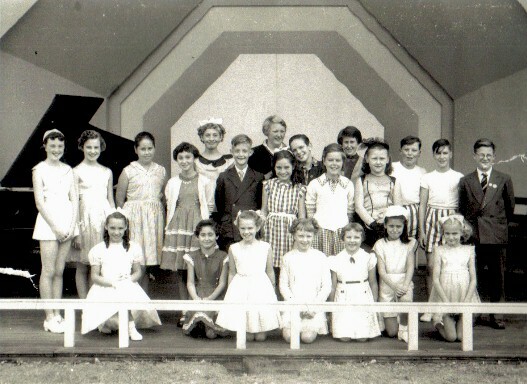 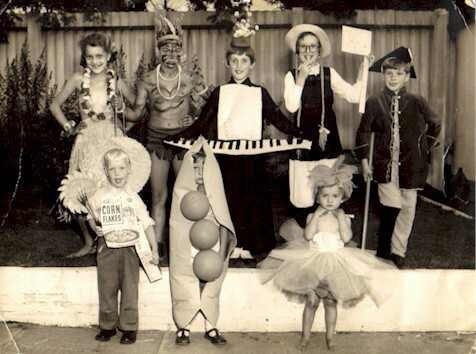 We acknowledge the help of Chris Hall who has sent to us a selection of old photographs of the 'HARRINGAY FAIR' that apparently took place in the Rec back in 1969. 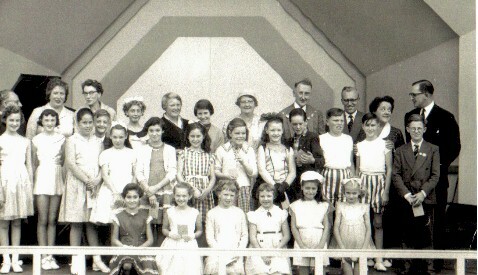 These had been inherited from his father in the form of some old negative films that have since been converted to digital images. 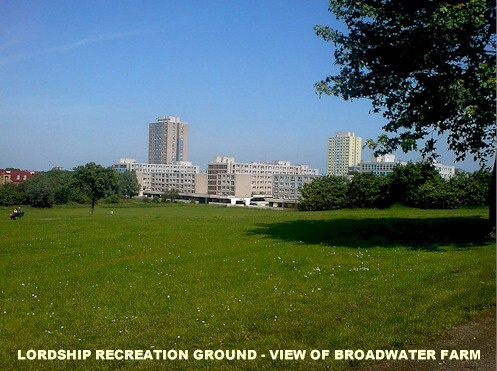 Note the early development of 'Broadwater Farm' in the background. 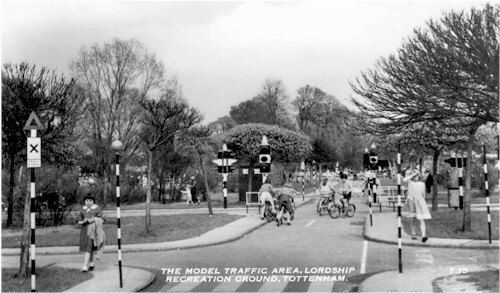 Chris has also provided some lovely old photographs showing the junction of Lordship Lane with Downhills Way. 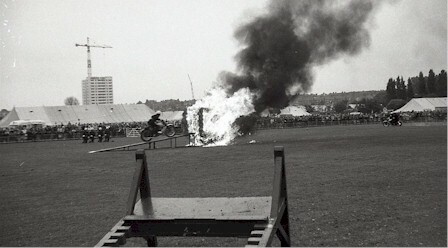 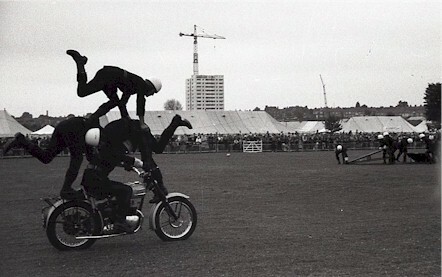 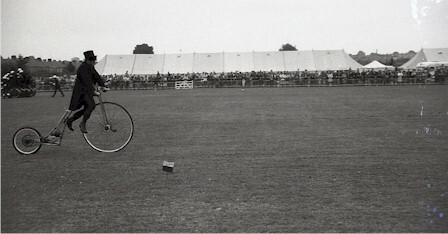 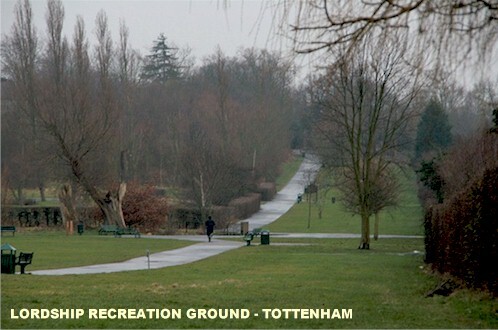 See old Tottenham photographs feature to view these images. 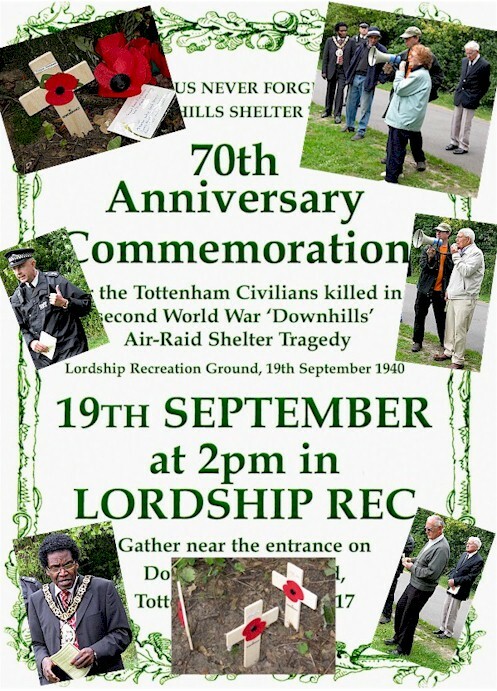 The full story regarding the Downhills Shelter Tragedy, and the tragic loss of over civilian 40 lives in Tottenham, can be found elsewhere on the website but it is perhaps appropriate that we include some reminders from the special commemoration ceremony held in September 2010 that marked the 70th anniversary of the tragedy. 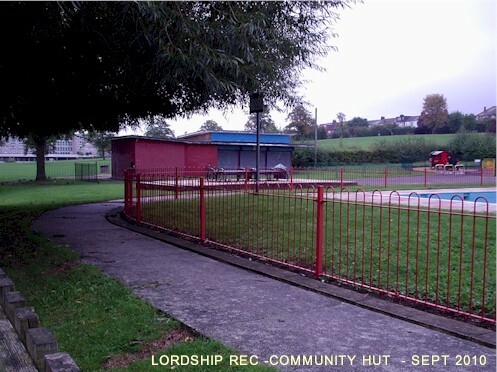 Sadly over many years Lordship Recreation Ground was allowed to fall into a state of disrepair, however, on a more positive note, we understand that in a recently published strategy document for 'Lordship Recreation Ground' there are plans to renovate and redevelop the facility which will also include a BMX track etc. 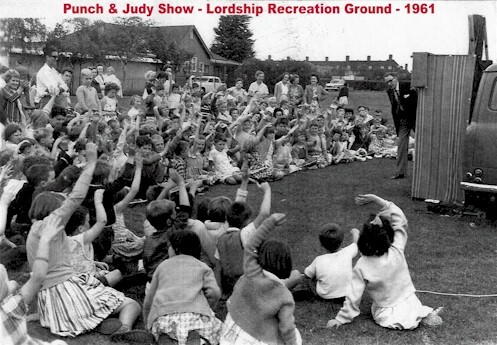 Clearly this is not before time and hopefully the children in Summerhill Road today will be able to enjoy the wonderful experiences we had in our childhood. 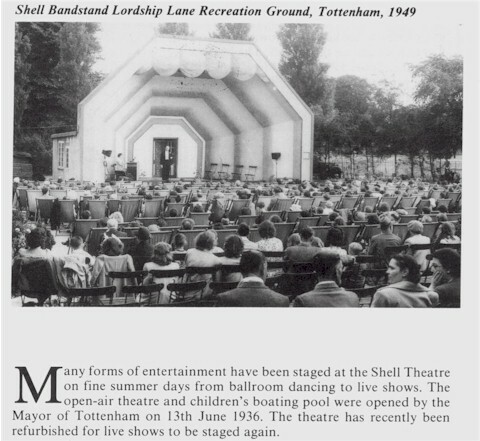 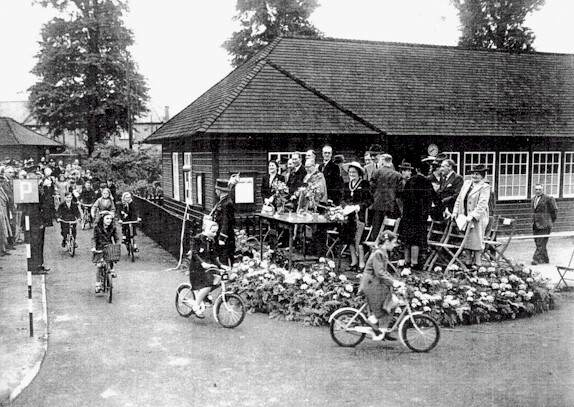 Also included in the strategy documents are plans to renovate the Shell Bandstand. 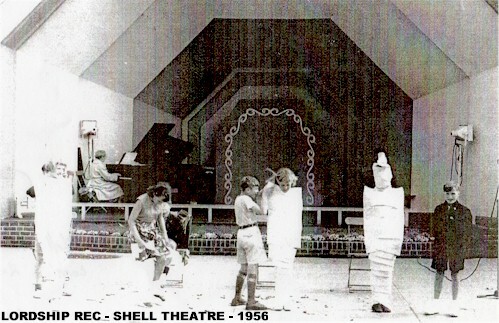 Apparently it was shaped like a shell for improved acoustics. 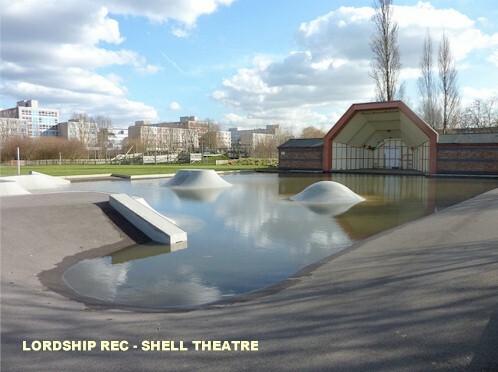 (A forerunner for Sydney Opera House perhaps !) 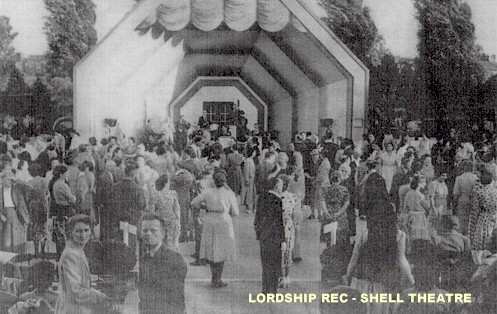 The shell was originally painted in delicate shades of yellow and green. 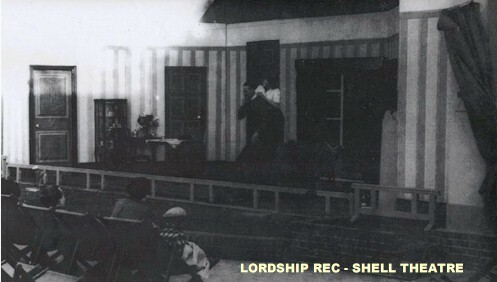 The sunken auditorium seated 250 persons in deckchairs. 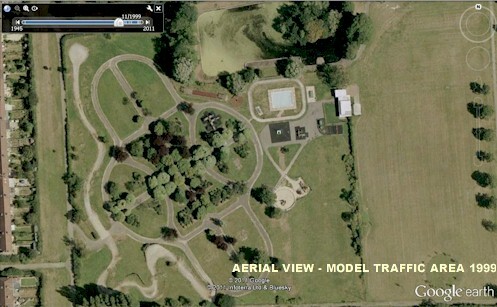 A sunken garden in front and to the sides of the stage was planted in choice blooms and rock plants. 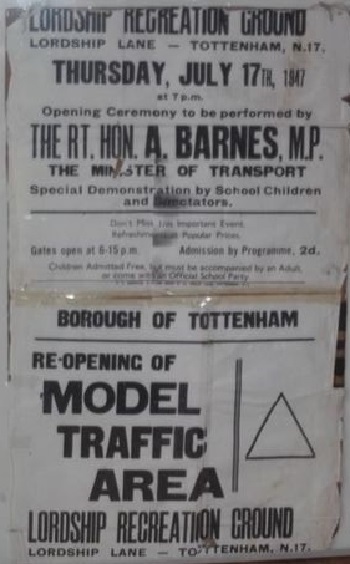 Let us hope that these redevelopment plans are realised for it will be a tragedy if these unique facilities from Tottenham's past are allowed to be destroyed. 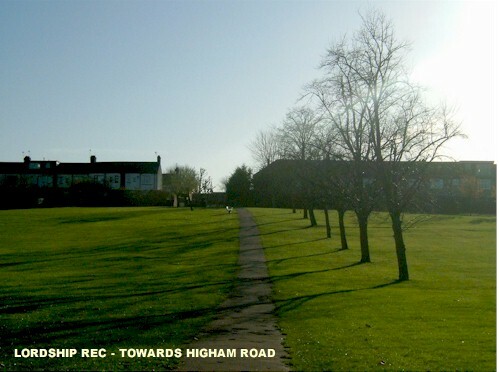 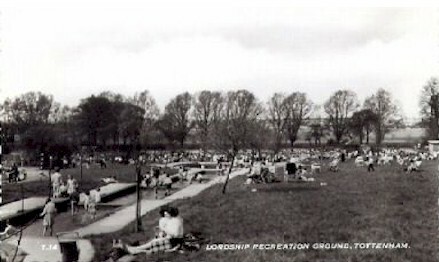 The restoration of the Rec could not be achieved without the tireless work of 'The 'Friends of Lordship Recreation Ground' who are a group of like minded people committed to preserving this wonderful amenity for the residents of Tottenham. 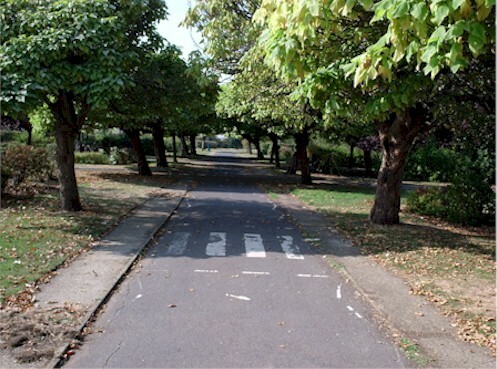 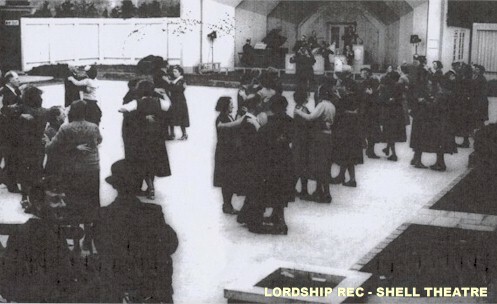 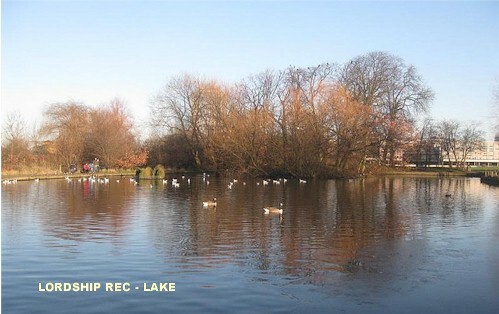 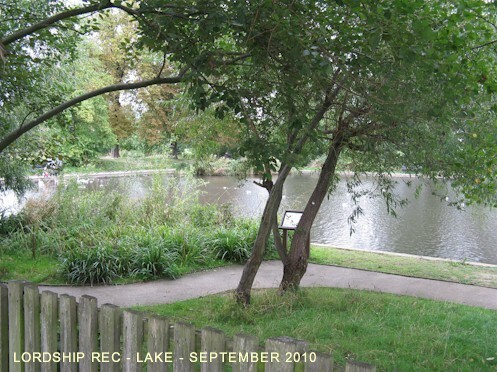 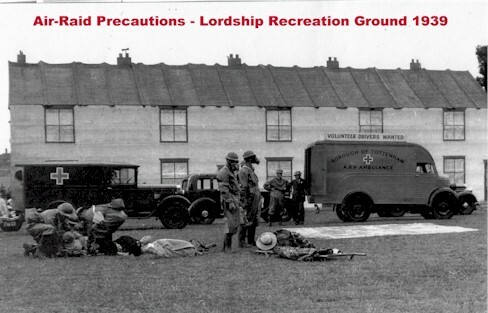 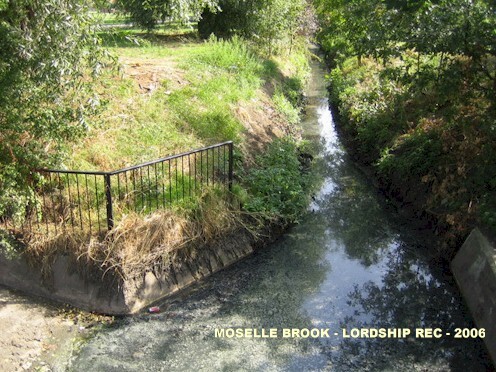 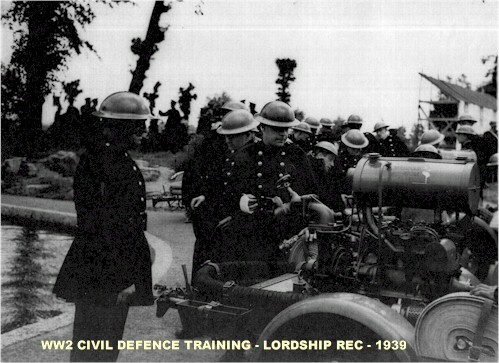 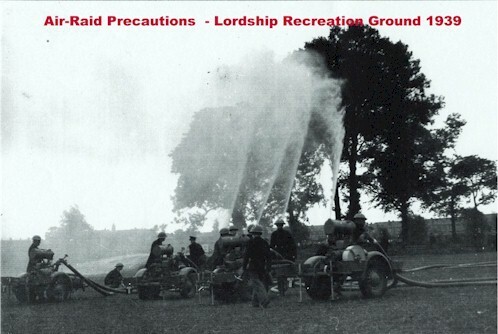 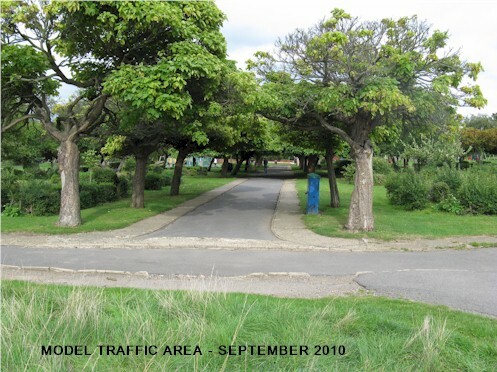 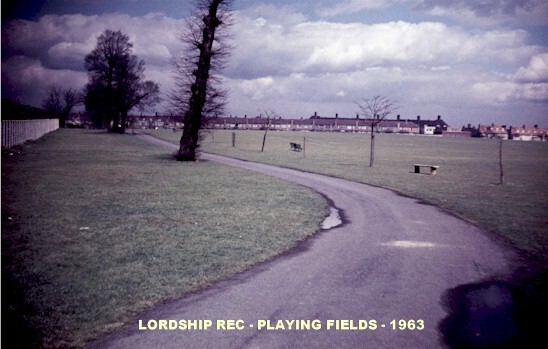 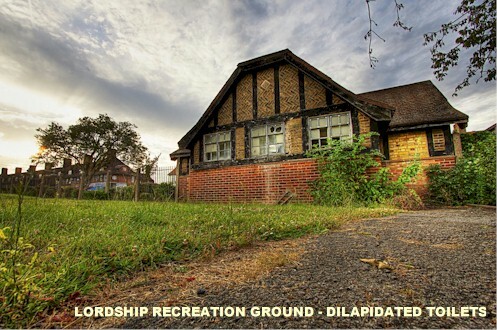 Click HERE for more information on the work of 'The 'Friends of Lordship Rec'.